Until just a few years ago, putting was considered a black art. You were either a labeled a great putter or terminally diagnosed with the “yips.” Quite a few significant strides in golf instruction during recent years have occurred in the area of putting, and the methods used by touring pros in recent years have narrowed considerably. This post discusses the prototypical setup/address position that I see used by most tour players nowadays. The setup position that good putters use is quite often counter-intuitive to the beginning or intermediate golfer. There are easy mistakes to make. How do we created a setup position that simultaneously creates balance and optimal alignment? Let’s take a look at a down-the-line view of Luke Donald, who has been ranked in the top-20 strokes-gained-putting for 9 of the past 15 years and was ranked #1 for two consecutive years in a row during 2010-2011. Too much weight in the heels. This has a cascading effect on at least three variables above causing the player to lose that “out-over-the-ball” look and feel to the setup. A line drawn down from the crease of the pants hits behind the heel, not 1′-2″ in front of it. The ball inside the eyes. This pulls the body backward toward the heels. It’s better from a balance and aiming perspective standpoint for the ball to be somewhat outside the eyes. Conventional wisdom calls for the ball to be directly under the eyes but too many great putters just don’t do it that way. 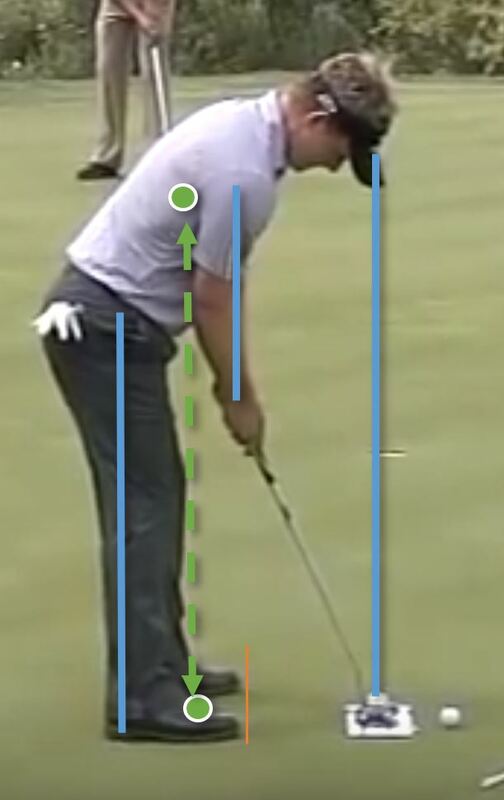 tops of the forearms will aim left producing a leftward bias to the putter head path.